It’s a weeknight and the pressure is on to provide a quick and nutritious meal for your family. After a long day at work or running around the children all day, all you want is a quick-fix meal with little fuss. 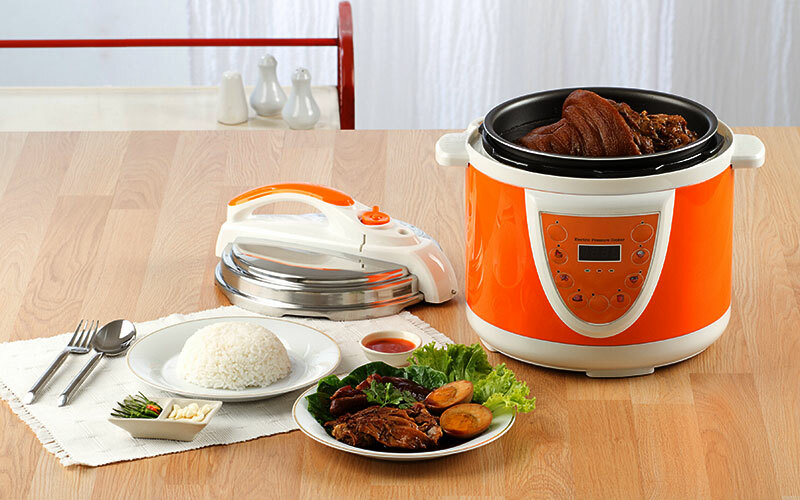 A top-class pressure cooker would be an ideal kitchen companion, having your favorite feast ready in super-fast time. Anything that you would normally boil, braise or stew can be made in less than half the time, saving you both time and fuel. Furthermore, cheaper cuts of meat can be made tender quickly and as such, there are monetary savings to be made too! The pressure cooker has long been a popular feature of kitchens in Europe and Asia and is undergoing somewhat of a revival, resulting in lots of choices on the market today. They have come a long way from the older models that your grandma used to use and are now much more sophisticated in their features and safety. So, here we present at our top ten best pressure cookers, making it even easier for you to choose the one that’s right for you and your home. Who Are Pressure Cookers For? Should You Upgrade or Change Your Current Pressure Cooker? In the four years of reporting and updating this site, we’ve considered about 20 different pressure cookers and have tested most of them. Here we unveil our Top Ten products, helping consumers decide on the best quality product for them. We have spent over 55 hours researching online and spent a week testing the products through community-based usage in addition to testing most of them ourselves. Our main purpose is to help customers to select the best product, not to promote any particular brand or product. With this in mind and considering some of the most important features, we picked out the most effective pressure cookers on the market. First of all, let’s have a look at how they work. Although some pressure cookers can look like a regular pot on the stove, they have a modified lid which locks onto the pot to create a seal. Pressure cookers work by increasing the temperature that is needed for water to boil and, as such, must be used only with liquids. As the temperature is increased, the liquid creates steam which can’t escape, causing an increase in atmospheric pressure. The increase in pressure (which is usually 15 pounds per square inch (psi) higher than normal sea-level pressure) causes the boiling point of the water to increase by approximately 30°F. This is why the cooking time of your meals can be up to two thirds faster. Once the pressure cooker has reached the maximum temperature, a release valve opens allowing steam to escape and the pot to maintain a regulated temperature. Most pressure cookers are preset to increase the pressure by 15 psi but some have a lower setting (e.g. 10 or 11 psi) for foods that are more delicate. As a result of the higher temperatures, the food inside cooks much quicker than in a conventional pot or in an oven. Pressure cookers, therefore, use less energy in the home due to the reduced cooking time. Furthermore, in comparison with boiling, pressure-cooked foods preserve more of the nutrients because there is less water used in which nutrients often disperse. Additionally, pressure cookers can be used effectively in high-altitude areas to combat the lower atmospheric pressure at higher elevations. They are really quite useful bits of kit! Would a pressure cooker suit you and your needs? Yes! They are for anyone who loves the flavors and tastes of healthy, home cooking. Let’s have a look at who would benefit from a pressure cooker. Novices: Are you new to pressure cooking? If so, following our guide and recommendations, it couldn’t be easier to get started and see what you can concoct in the kitchen. Everyone who owns a pressure cooker has once been a novice cook! For a beginner, an easy-to-use, no-fuss model would be best. Set-it-and-forget-it options, particularly with the functions of electric models, would make your transition into pressure cooking even easier. Professionals: Pressure cookers are ideal for home use but that does not mean that they can’t be used by professional cooks too! Using a pressure cooker, a chef could rustle up a professional standard stew or pot roast in half the time – ideal for the busy restaurant kitchen. Of course, professionals are more likely to have the need to cook larger quantities and so the ideal model would be those with a large capacity such as our advanced option. Canning capabilities would also benefit professionals, providing the possibility of storing many of their delicious food for longer periods of time. Travelers: As mentioned elsewhere, pressure cookers can be extremely portable! Some of the smaller pressure cookers are ideal for taking with you wherever you go, whether that be in an RV, a sailing boat or a rented place. Students: Being small, relatively inexpensive and portable, students will most certainly benefit from owning a pressure cooker. It will allow them to make meals with all the tastes of home at an economical price and saving them time so that they can get back to their studies (or their social life!). They could even be beneficial for their social life – who doesn’t want to be friends with someone who can prepare delicious home-cooked food in minutes! The environmentally conscious: Pressure cookers cook food up to 70% faster than other cooking methods meaning they use a lot less power and fuel in the home. Moreover, they can tenderize even the most economical cuts of meat, saving you even more! With some models offering 12-year limited warranties, you can also be sure of the longevity and durability of the product. It won’t just wear out and be on the junk pile in a year or two! If you already own a pressure cooker, at some point you may want to start thinking about upgrading, especially if you are using an outdated model. Pressure cookers have come a long way since the post-World War II days when they were akin to ticking kitchen time bombs! All post-1990 pressure cookers are safer than before as they have additional safety features and secondary pressure release valves, so if you are still using your granny’s old one it is definitely time to upgrade. Today, the newer models have many settings, digital displays, and high-tech controls. Many of the newer versions also have slow-cooker functions, various timing settings and sterilizing options! Once you have decided to take the plunge and buy a pressure cooker or upgrade your current model you may find yourself somewhat overwhelmed with the choices available. Here, we hope to answer your queries about what makes a good pressure cooker and what features you should be looking for. Composition: Aluminum, stainless-steel or a combination of both? Aluminum boasts the advantages of it being light-weight, inexpensive and better at heat conduction. However, it is prone to staining and although this does not affect the pressure cooker’s functionality, it’s something to consider when weighing up the durability of the product. On the other hand, stainless-steel is sturdier and more durable than its counterpart but with the disadvantage of being heavier, more expensive and being less efficient at transferring heat. For the best of both worlds, consider a model that combines the two materials: durability and top functionality in one! Some of our reviewed models contain nonstick inner pots, which is another of the more inexpensive options. Features: Our reviewed pressure cookers have between 7 to 20 different features. Some of these can be considered non-essential depending on your needs. You need to first decide what it is that you want from your pressure cooker. If you want to cook simple, regular meals then you may wish to opt for a simpler product rather than consider a pressure cooker with an additional rice or yogurt making settings. The reviews on each of the products will help you decide between what features are essential and non-essential for you. 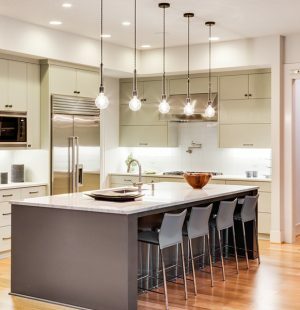 Size: Consider if space in your kitchen is a premium and how many people you cook for on a regular basis. Weigh up whether your pressure cooker will be used principally for small family meals, for entertaining larger groups of people or for canning large quantities of food. A 4-quart model is ideal for an individual or a couple. Six-quart and 8-quart models are ideal for smaller (up to four people) and larger families respectively. The 21 ½ to 23rd quart options that we have reviewed here are bigger than most people should need but are ideal for entertainers, those that cook in bulk or for people who want to use their cooker as a pressure canner. Safety: You don’t want to be compromising on safety. Having a product which has a UL and ULC certification will give you peace of mind and ensure unwavering safety. Some of our reviewed models have up to ten additional safety features. Pressure release valves can vary between weighted and spring-loaded styles. Weighted release valves are typical of the first generation pressure cookers and perform a rocking motion when the pressure builds. Second generation models tend to have spring loaded release valves and additional features such as locking lids. These features ensure that you avoid the much-feared explosions of days gone by. Of course, any additional safety features are often reflected in the price of the product. Warranty: Finally, look for a model with a good length warranty. 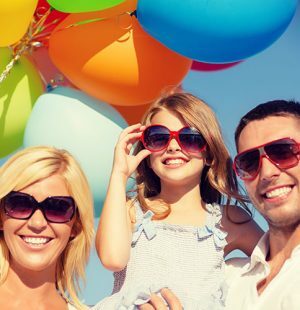 The most reputable companies will offer long warranties with some as long as 12 years. However, some of the electric models tend to have shorter warranties with some as short as 60 days! 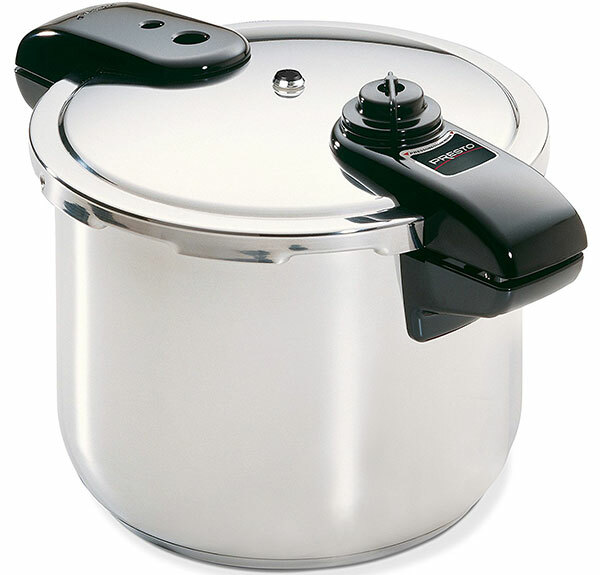 There are essentially three different types of pressure cooker on the market today. The popularity of electric pressure cookers has increased in recent years. 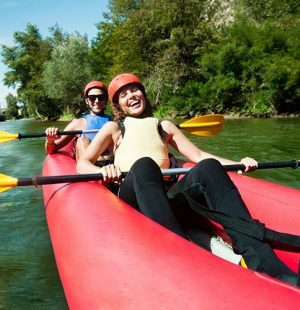 They boast the advantages of being versatile, user-friendly and not to mention safe. They are ideal for cooks who enjoy the convenience and “set-and-forget” functionality. This is a definite bonus for those with busy lives who can be otherwise occupied when cooking a meal. Additionally, they’re ideal if you frequently use all the burners on the stove at once! Most electric pressure cookers have multi-functionality – they can double us as a rice cooker, slow cookers and even steamers too. So you don’t have to worry about whether to buy a pressure or a rice cooker. Most electric pressure cookers possess a delay-start option and some even have the option of buying fridge-safe liners so that your meals can be prepared in advance and you can then just pop them in a press ‘go’! The electric pressure cookers do tend to be larger than the stove-top variety and they often don’t reach pressure to the same level. However, that’s easily remedied by adding a few additional minutes during cooking. One issue with electric pressure cookers: they will turn off or switch to their “keep warm” mode if there is not enough liquid in the pot, which is a common problem when cooking large cuts of meat. Be sure to use at least two cups of liquid to prevent that from happening. The traditional type is the stove-top design. Today, they are still popular in homes today. Looking like a standard stove pot, you can use them on all types of kitchen stove even propane-powered stoves. However, some of the weightier models cannot be operated on ceramic or glass stovetops. You do have to keep an eye on stove-top pressure cookers, unlike their electric counterparts. Some models also need to have the pressure released by hand after a time period. Nevertheless, they heat food quicker and reach a pressure that is higher than electric pressure cookers. They also come in a broader range of sizes. Pressure Cooker Canners are used to preserve food, such as fresh non-acidic fruits and vegetables. Canners don’t have to be a specific model, the stove-top pressure cooker can also double up as a pressure canner due to its high pressure. 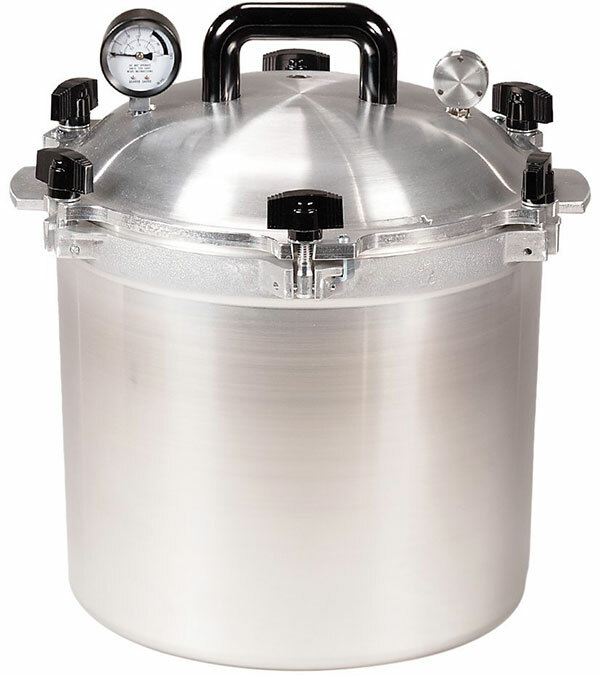 Often, pressure cooker and pressure canner are used interchangeably. Nevertheless, those who are keen canners who like to make lots of food in bulk may wish to purchase a product that is specific for canning. These cookers are usually heavier and larger than regular pressure cookers for everyday use. They also often come with accessories to make the canning process even easier. It must be noted that electric pressure cookers cannot be used for canning. Now that you know a bit more about pressure cookers, how do you know if they’re for you? As explained above, pressure cookers have distinct advantages. Do you want to cook your meals faster? Save time and energy in your home? A pressure cooker can cook a whole chicken in less than 40 minutes, which is a lot faster than in your conventional oven. Sounds good, doesn’t it? To put it simply, with a pressure cooker you can make one-pot dishes in speedy time. You can also cook simple meal accompaniments, like rice or beans. As well as reducing your energy consumption through quicker cooking times, there is also a monetary saving to be made given that cheaper cuts of meat can be braised and tenderized more rapidly than they otherwise would be. In fact, pressure cookers are said to be the quickest way to make healthy meals. Pressure cookers are also cleaner and emit less heat and cooking smells in the home due to their seal-locked lids. This also means that the food is more flavorsome as all of the flavors remain locked in the food. However, there are some considerations to make. You should not consider buying a pressure cooker if you intend to leave it cooking while you are not at home, especially with the stove-top style. Pretty much any pressure cooker can cook a tough cut of meat or braise a chicken fairly well so we had to carefully select which models to review in depth. In four years of reporting and updating this guide, we’ve considered about 20 types of pressure cooker and tested most of them. 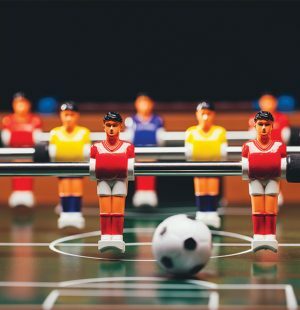 Though none of these products are perfect, we have found that these models are the best available. We spent close to two months using these products by community-based usage to see how well they performed. Through careful research and use, we measured the performance of our tested products and analyzed their capacity, maintenance, versatility, material, cooking performance, depth, usability and some of the other most important features. 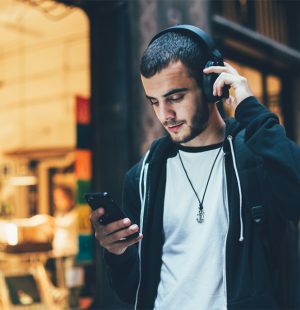 After comparing all of these elements and consulting a lot of users, we selected our Top Ten products. We are confident that the pressure cookers mentioned below are generally the best on the market. For each of our Top Ten rated Pressure Cookers, we have analyzed 36 important features. Our research report is available for our readers to view in order to help you choose the best product for you. In order to view the report please like any of our social media pages. Please read our Pressure Cooker Reviews below for more details on each product. Before we jump into the review of this product, let’s first look at why we chose this model as our top pressure cooker and what makes it our best choice. Affordable yet it offers great features! With digital controls and multiple cooking options, this small pressure cooker is a tough one to beat. for each of the products we have selected. The Instant Pot DUO60 contains the maximum number of positive features and a unique combination of the most positive features, as you can see from our research report. It features 11 Smart Programs with digital controls and a 3-quart capacity. It also has a delay start option, automatic Keep-Warm option (up to 10 hours) and the flexibility of turning sound on or off. This product comprises of a stainless steel cooking pot (food grade 304, 18/8) without any chemical coating. It has a 3-ply base and is dishwasher safe. This product is in an affordable price range and you can buy it for under $70. We compared the rating frequency of each of the reviewed products for the 30 most recent ratings and found that this product is receiving ratings at a very fast rate. It received first 30 ratings in just 1 day. This product holds the rare combination of many of the most important features compared to the other products we have tested. It also comes with 7 different useful kitchen appliances in 1 cooker. Simply put, our Top Pick Pressure Cooker is suitable for almost everyone hence why it’s Stuffoholics’s number one choice! Although this Pressure Cooker is the smallest of our choices, the Instant Pot DUO60 features loads of built-in features designed to make your cooking much easier. With its affordability, it is a pressure cooker that anyone can use effortlessly for a whole host of meals. Let’s look have a closer look at its features. 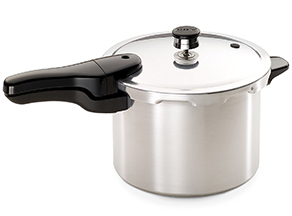 This electric pressure cooker is made from 18/8 stainless steel with no chemical coating and has a 3-ply base. The stainless steel ensures its robustness and provides enhanced durability in comparison to aluminum models. It is also dishwasher safe making it very easy to clean. 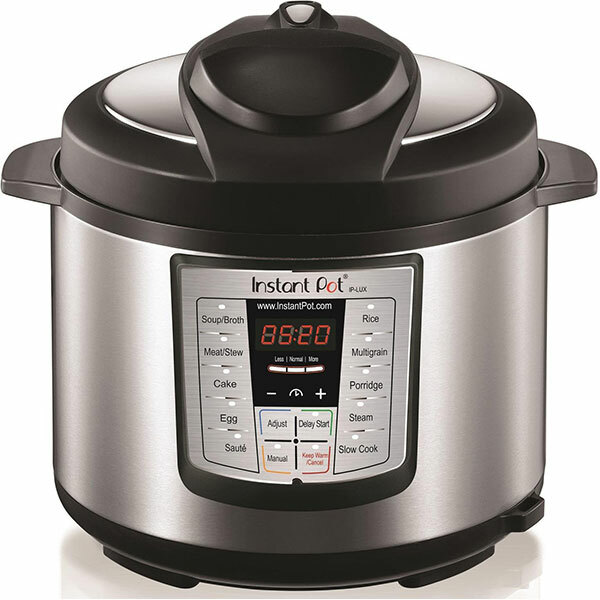 With its 3-quart capacity, this Instant Pot is the smallest of our reviewed pressure cookers. 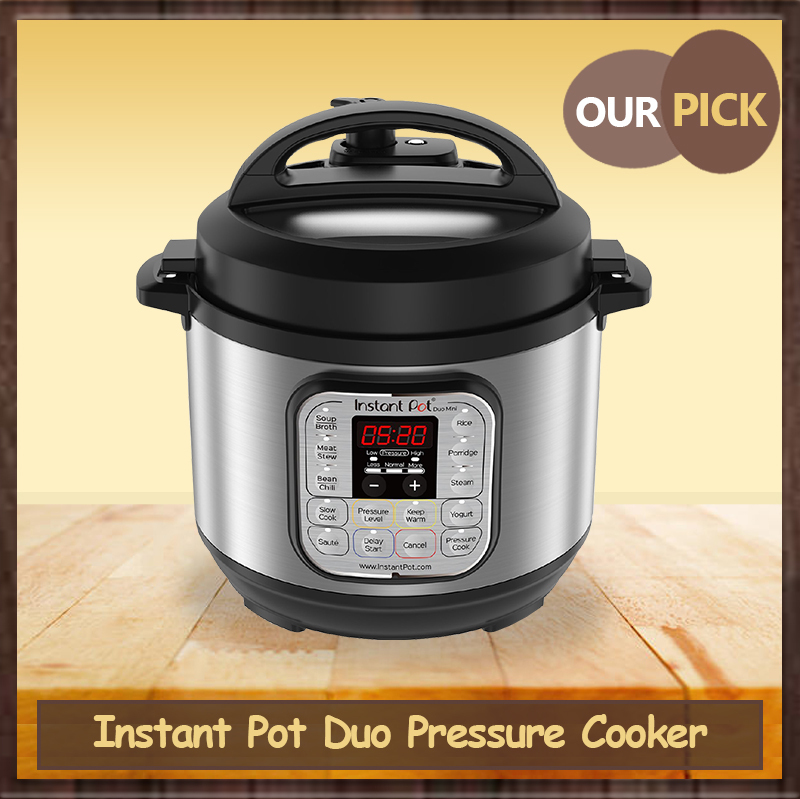 It is ideal for smaller families, couples or as an additional pressure cooker perfect for side dishes. Its reduced size makes it more portable and flexible. It would be a great addition to any traveling family driving an RV or sailing. You could even send your offspring off to college with this product! The pot can make 12 cups of cooked rice (6 cups uncooked) but please ensure you use the cup measure accessory provided! This pressure comes with a great deal of reassurance. It has UL and ULC certification and is built with the latest third generation technology. Its microprocessor monitors the temperature, pressure, time, and heat intensity. Indeed, Instant Pot’s tagline is that this pressure cooker is convenient, dependable and safe. Furthermore, it comes with 10 safety mechanisms making it one of the safest and reliable pressure cookers on the market. This is not just your average Pressure Cooker. The possibilities are the key here. The Instant Pot boasts to be seven kitchen appliances in one: a pressure cooker, rice cooker, steamer, slow cooker, sauté/searing pan, yogurt maker and warmer. It features 11 customizable smart programs: rice, soup, meat and stew, yogurt, beans and chili, sauté, steam, porridge, keep warm and slow cook as well as the simple ‘pressure cook’ setting. It provides no-nonsense, straightforward cooking options at the touch of a button! It also has an auto ‘keep warm’ function (for up to 10 hours) and a 24-hour delay start option. Size: this is the smallest of the products that we have reviewed, which makes it not the best choice for larger families. However, it does come in bigger sizes! Warranty: this product comes with a 1-year warranty, which is 11 years less than many of the pressure cookers that we have looked at. This top rated pressure cooker is, in our opinion, the best pressure cooker on the market. It combines functionality with flexibility in a compact and robust, time and energy-saving device and is a most worthy addition to any household kitchen – a win for the health and environmentally conscious among us in today’s face-paced world! No doubt why so many cooks prefer instant pots like this! Made to last, this budget-friendly cooker can cook up to ten times faster than typical cooking methods! 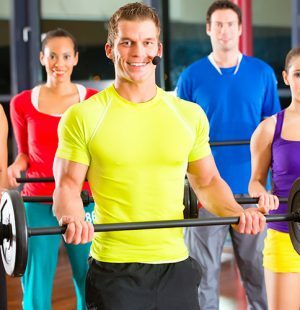 What’s great is that it’s very easy to use even for beginners. The Presto 6-Quart Aluminum Pressure Cooker is our chosen Budget Pick. Having the lowest price of all of our reviewed pressure cookers, it is a product that is suitable for even the tightest of household budgets whilst still holding many of the positive features by which the quality of a good pressure cooker can be measured. It cooks three to ten times faster than other cooking methods, is easy to use and has a 6-quart capacity. The frequency and quality of its ratings are also very good and in spite of being a budget option, it comes with a special rack for cooking several foods simultaneously. It also has a 12-year limited warranty – not bad for a budget pick! Despite its economical price, it holds many of the positive features by which we have measured the efficacy of our reviewed pressure cookers, hence why it’s our Budget Pick. Made from strong, heavy-gauge aluminum and with a 6-quart capacity, it is twice the size of our Top Rated pressure cooker, meaning that it’s even easier to cook for larger families and for cooking bulk recipes (again, another pro for the money-conscious consumer!). As stated, this Presto Aluminum Pressure Cooker can cook three to ten times faster than ordinary dry cooking methods, saving you time, energy and money – a definite plus for those who are choosing a pressure cooker on a budget! It comes with easy-to-follow instructions and 65 delicious recipes ranging from soups and stocks to pot roasts and five-minute desserts! It has an inbuilt pressure regulator, which maintains the correct cooking pressure automatically and has a cover lock indicator showing that there is pressure inside the cooker. This prevents the cover from being opened until the pressure is safely reduced. There is also a simple steam release mechanism and an overpressure plug that will let off steam should it build up excessively. Other consumers are clearly pleased with this budget pressure cooker too. As part of our review process, as you can see in our report, we compared the rating frequency of each of the reviewed pressure cookers. We found that the Presto 6-Quart Aluminum is receiving very frequent ratings. The first 10 ratings were achieved in 10 days, its second 10 in 15 days and its third ten in 9 days. Also, it has an averaging rating of 4.3 stars, which is very pleasing for a budget-friendly product. With its 12 years of limited warranty, you can have peace of mind that this purchase will last – another reason that it’s the most economical choice! Despite being a budget buy, this top rated pressure cooker also comes with a special rack enabling you to cook several foods at once without any intermingling of flavors. Furthermore, without its lid, it can double up as a regular stove-top pot! Aluminum, so not as robust or durable as its stainless steel counterparts. Despite being dishwasher friendly, the pressure sealing ring and overpressure plug must be removed each time. This pressure cooker certainly ticks a lot of boxes for the budget-conscious cook! It could not be simpler or safer to use, especially for those who are new to pressure cooking, providing delicious and nutritious meals in super quick time. With a 12 year limited warranty, it’s an economical addition to any home kitchen! Need restaurant-level cooking? Look no further! This multi-purpose pressure cooker can cook & can at high altitudes. It’s also the largest at 23 Quarts! A definite must-have. This largest of this top rated pressure cooker list is the Presto 23-Quart Canner and Cooker. From our research report, you can see that this product has some of the most important and advanced elements among all the pressure cooker features that we have analyzed. Despite being our ‘Advanced Pick,’ it also falls into an affordable range. Again, this pressure cooker is popular, receiving ratings at a comparable and competitive rate compared to some of the products that we have reviewed. Finally, it is the only one of our reviewed pressure cookers that registers the entire range of pressures suitable for processing, hence why it’s our selected advanced pick! If you’re wanting more from a pressure cooker than just cooking your evening meal or you are experienced in pressure cooking and are looking to upgrade then this is the one for you! The Presto pressure canner and cooker is 23-quart capacity and made from warp-resistant heavy duty aluminum ensuring fast and efficient heat distribution. 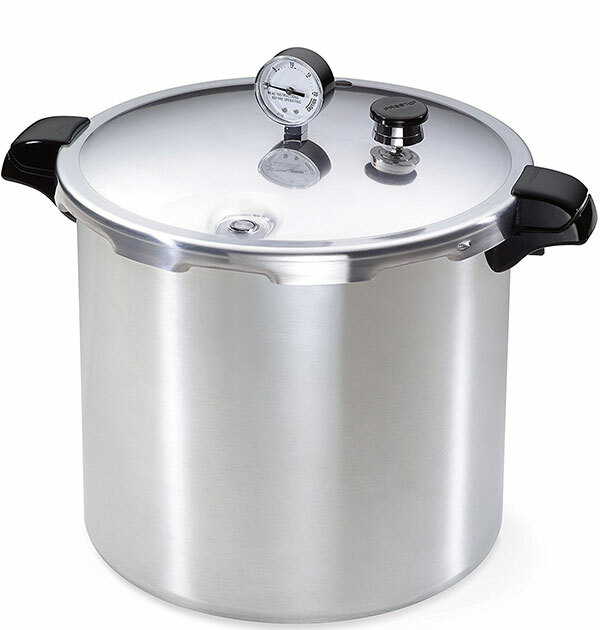 This is the largest of Stuffoholics’s reviewed pressure cookers and is therefore ideal for all your pressure cooking and canning needs in the home. In fact, the US Department of Agriculture states that pressure canning is the only method suitable for the home canning of low-acid foods like vegetables, meats, poultry, and seafood. This professional-quality pot is suitable for both regular and smooth-top ranges and has cool-touch handles and a locking steel lid. Along with a pop-up pressure indicator and a straightforward steam release process, there is an overpressure outlet that will release steam if it builds up too much. The Presto 23-quart canner and cooker’s deluxe pressure dial gauge registers the complete range of processing pressures. The dial gauge gives a precise reading, ensuring that pressure is kept constant during the canning process. This precise measurement is especially important when pressure canning or cooking at higher altitudes. To ensure safety, the air vent allows pressure to increase only if the lid is closed properly and stops the lid from opening until the pressure has safely receded. The canner can also be used as a water bath canner for fruit preservation, jelly and jams, sauces and pickles in pint and half pint jars. In addition to its canning possibilities, it doubles up as a large home pressure cooker suitable for any weeknight dinner or for meals that need preparing quickly. The additional booklet contains over 50 recipes, including basic soups, stews and pot roasts – even brown bread or desserts like Plum Pudding! Cleaning – not as easy as some of the other pressure cookers. 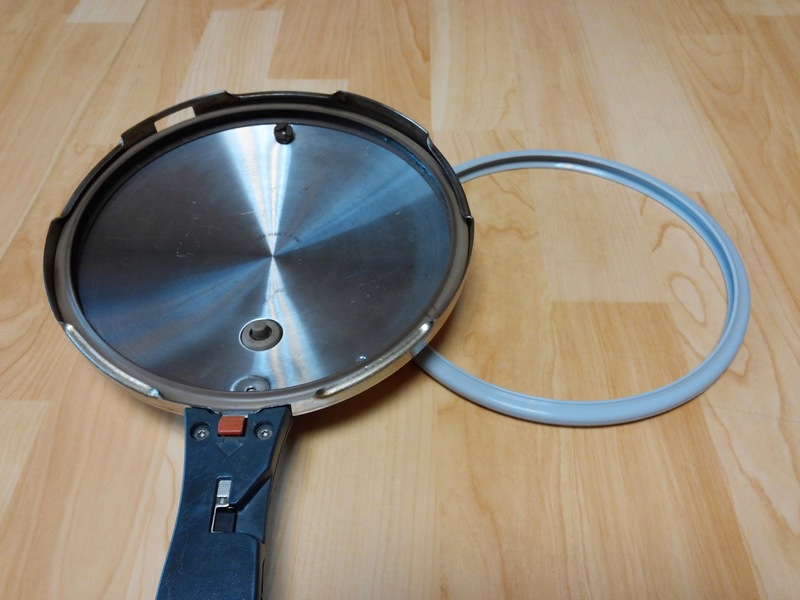 The lid is not able to be submerged in water and the parts to the lid must be cleaned separately, for example, the sealing ring and vent pipe. For an advanced canner and pressure cooker, this is our recommended choice. The possibilities with this product are endless! However, it’s a lot more cumbersome than our other picks and cleaning and handling can be tricky (the pressure gauge is delicate and needs to be handled with care). For an advanced product, its price is very reasonable. If you want a slow cooker, rice cooker, steamer, saute, steamer and a warmer, you don’t need to spend your money on all those products when you can have it all with ONE great pressure cooker! Twice the size of our Top Pick, the Instant Pot LUX60 6-quart electric pressure cooker occupies our number four spot. Made with an 18/8 stainless steel inner pot, it ensures even heat distribution and durability. The fully sealed environment guarantees that the flavors, nutrients, and aromas remain within your food. This pressure cooker comes with UL and ULC safety certifications and includes 10 safety mechanisms designed to eliminate many common errors to provide users with assurance and confidence. It houses the most up-to-date 3rd generation microprocessor, providing a maximum of 240 minutes pressure-cooking and delay-start function. It also keeps food warm automatically for a maximum of 10 hours and has 3 choices of temperatures in Sauté & Slow Cooking Modes. The finger-print proof brushed stainless steel exterior also boasts a large display panel. The Instant Pot LUX60 contains six appliances in one. No need to buy a pressure cooker, slow cooker, rice cooker, sauté, steamer and warmer when all of these are encompassed in this product! It also has 12 built-in Smart Programs to cook your favorite dishes with the simple push of a button: soup/broth, meat/stew, cake, egg, sauté, rice, multigrain, porridge, pressure cook, keep warm, steam and slow cook. This top rated pressure cooker also comes with accessories, including a stainless steel steaming rack, rice paddle, recipe brochure, soup spoon, measuring cup, manual and time charts. A good all-round electric pressure cooker from the same family as our Top Rated pressure cooker. Its 6-quart size makes it suitable for family dining and all at the ease of a pre-set program button. With good reviews and ratings and in an affordable price range, this is certainly a kitchen appliance worth considering for those wanting to maintain a fast-paced, healthy lifestyle. It currently retails in the mid-range and slightly below average in terms of price amongst our Top Ten. With amazing functionality, this 7-in-1 pressure cooker also comes with the least cleanup requirements. Easy maintenance for good performance! With its wipe clean brushed stainless steel housing and digital display, this 6-quart Power electric pressure cooker is a top rated pressure cooker with great 7-in-1 functionality. The non-stick aluminum pot is easy to clean and the large arm handle means you can use it with ease. 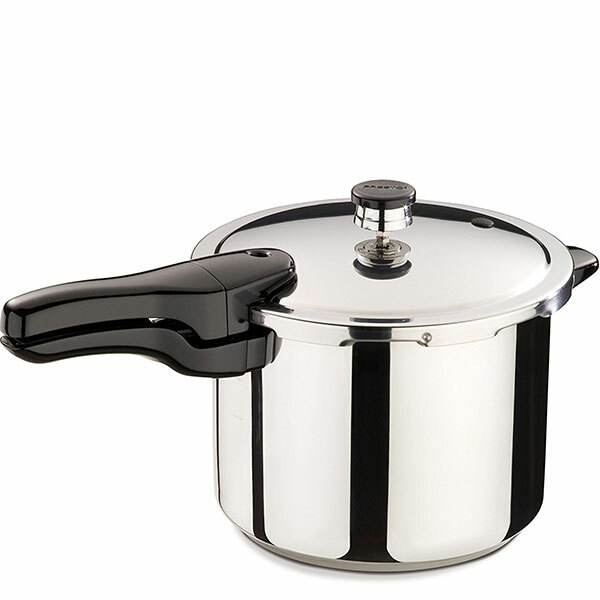 With space for four wide-mouth jars, this pressure cooker can also be used as a pressure canner. This product features a safety release valve, pressure indicator, auto-lock handles, safe locking lid with manual steam release and a Cool-Touch Exterior. It also has an automatic keep-warm feature. The Power Pressure Cooker XL boasts a slow cooking function, meaning your slow-cooked meals are ready in super-fast time with all the deliciousness of seemingly having been slow-cooked! There are also intelligent one-touch settings for meat, fish, vegetables, beans, rice, soup or stews. Beef stew for dinner? Just push the Stew button and the pressure cooker does the rest! It also serves as a soup maker, steamer and rice cooker. This pressure cooker comes with a Wire Rack, Steamer Tray, Ladle, Measuring Cup, Condensation Collector, Power Chopper, Instruction Booklet, Canning Book and Recipe Book. This product has great functionality and is ideal for those wanting quick-cook meals at the touch of a button. Despite its short warranty, it comes with very good ratings and reviews and is easy to clean. It definitely scores highly on ease of use! Its current price is slightly more expensive than some of our other reviewed electric pressure cookers. Easy to use and the ideal choice for home kitchens! This affordable pressure cooker doesn’t need a lot of maintenance so you can use it as frequently as you want. Plus, a 12-year warranty! 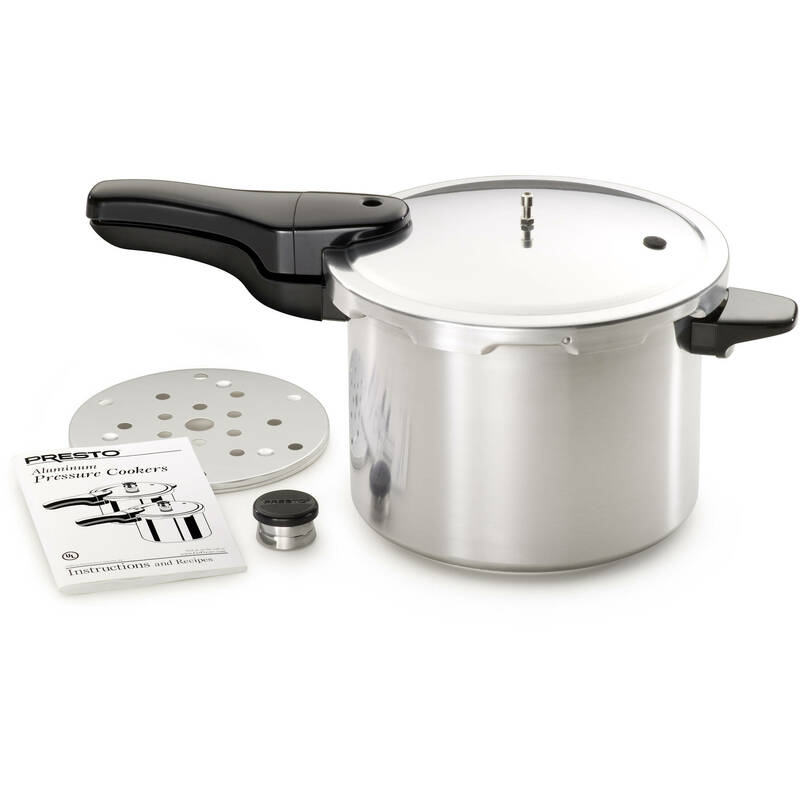 This 6-quart stainless steel stove-top pressure cooker is affordable, durable and easy to use. A step-up from our Budget Pick, it is ideal for use on regular, smooth-top and induction ranges. It features a helper handle for your ease of use. The robust lid locks during cooking whilst an internal sealing ring keeps the steam in. The pressure regulator maintains the proper cooking pressure automatically. A cover lock indicator shows when there is pressure inside the cooker and prevents the cover from being opened until pressure is safely reduced. As well as a pop-up pressure marker and a steam release mechanism, there is an overpressure stopper that will release steam if it increases to too high a level, ensuring that all pressure cooker safety standards are met. 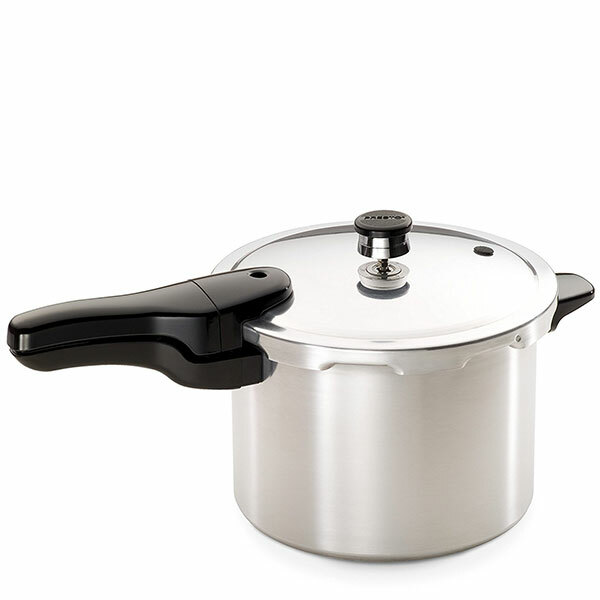 Furthermore, Presto’s 6-quart stainless steel pressure cooker is a multi-purpose pot that can stand in as a conventional soup pot. It’s dishwasher safe for easy cleaning, although there are parts that need removing and cleaning separately similar to the Presto 6-Quart Aluminum Pressure Cooker. This pressure cooker comes with a special rack for cooking several foods at once with no intermingling of flavors. It also includes a 64-page instruction and recipe book. A step-up from the Budget Pick Presto 6-quart, the stainless steel model offers extended durability with the same 12-year warranty protection. It is the second in terms of low-price after our Budget Pick of all of our Top Ten, making it affordable for most homes. It is simple to use and would make a great addition to any kitchen. Without fail, this 8-quart pressure cooker safely and thoroughly cooks all of your food for large family gatherings! Definitely something you’d want if you want flavorful dishes! This Presto Pressure Cooker is made of stainless steel construction with a special tri-clad base for fast, uniform heating. It is ideal for use on regular and smooth top ranges. The 8-quart pot is ideal for larger families of 7-10 members or for bulk cooking in your backyard. This pressure cooker has a pressure regulator which maintains proper cooking pressure automatically. Additionally, the pressure regulator and steam release valve offers an effortless “quick cool” option. For safety, the cover lock indicator shows at a glance when there is pressure inside the cooker and prevents the cover from being opened until pressure is safely reduced. It also has an easy-open cover with no buttons to push. The main pot itself is dishwasher safe for easy cleaning. The Presto 8-quart also comes with a stainless steel steaming basket for cooking several foods at once with no intermingling of flavors, meaning that your entire meal can be cooked with ease in one fell swoop. The product also includes a 64-page instruction/recipe book. The Presto 8-quart has all the same advantages as the other Presto pressure cookers that we have reviewed but with the added bonus of being just that bit bigger, making it ideal for larger families yet small enough not to be too unwieldy in the kitchen. Again, a 12-year extended warranty and stainless steel composition really make this a lasting product. 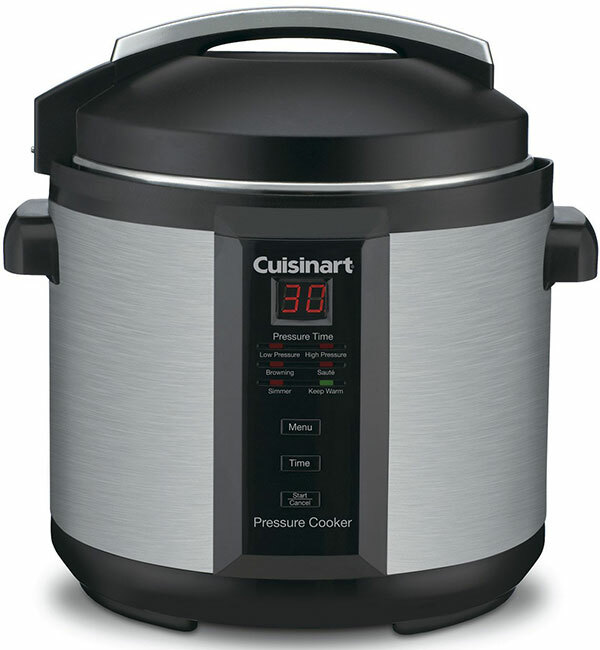 It currently retails as the third most inexpensive of our reviewed pressure cookers. With a digital LED display, cooking for large families in this durable pressure cooker is EASY. It has preprogrammed settings that make cooking quick and fuss-free. Even your kids can learn how to use it! This Cuisinart Electric Pressure Cooker has a 6-quart capacity that makes it a suitable choice for families. It has a durable fingerprint-proof stainless steel finish and a non-stick dishwasher-safe cooking pot, making it a good choice for any kitchen in a busy, fast-paced home. Furthermore, with push-button controls, cool-touch handles, and an easy-to-read digital display, it couldn’t be easier to operate. This product features a precision thermostat and a 99-minute LED countdown display for extra ease and accuracy with cooking, reducing cooking times by up to 70%. For safety, the cooker must be fully locked for pressure to build, and it will remain locked until the pressure inside drops to zero. This product has several pre-programmed settings for high- or low-pressure cooking, browning, simmering, sautéing, and warming all at the touch of a button. The keep warm setting can keep food warm for up to 12 hours. This pressure cooker also comes with a dishwasher-safe trivet and recipe book. The insert also has lines on the inside for the ease of measuring liquids. This is set-it-and-forget-it product making it a great addition to any busy kitchen. 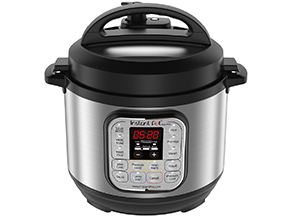 The three-year limited warranty is one of the highest of our reviewed pressure cookers and is the longest warranty of any of our reviewed electric models. 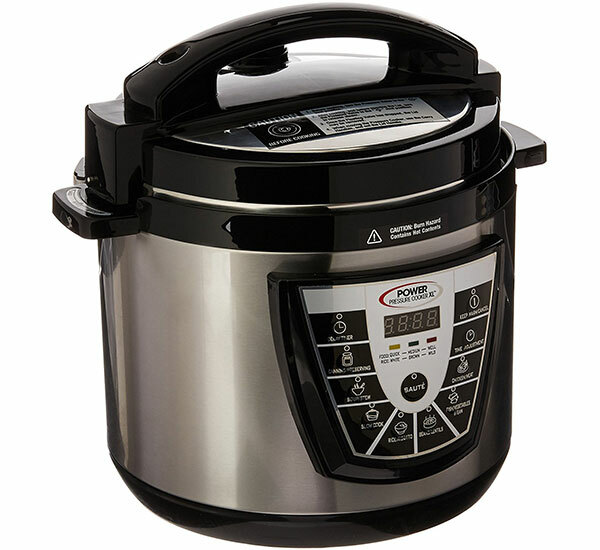 It currently retails in a higher price range than some of the other Top Ten pressure cookers and is comparable in price to our advanced pick. One of the fastest electric cookers we’ve tried, and it lets you enjoy time away from the cooker. No need to monitor your cooking every second! You can even get a whole chicken in less time. The Elite Platinum Electric Pressure cooker cuts time and money by preparing sumptuous meals 70% faster and using 45% less electricity than conventional cooking methods. Furthermore, its ease of use ensures that you are not having to stand over a stove monitoring your cooking. Housing a large non-stick inner pot, its 8-quart capacity is on the larger size of all of our top rated pressure cooker list and beats all of our other electric pressure cookers on capacity. It can even cook a whole chicken in just 30 minutes, locking in full flavor and nutrients and achieving that sought-after fall-off-the-bone goodness, making it ideal for the larger family or for entertaining. The Elite Platinum Maxi has passed every mandatory UL safety testing protocol and with eight incorporated safety devices and patented technologies, it provides you with uncompromised safety and reassurance. The pressure restricted valve will reduce pressure mechanically as it reaches pressure and a floater indicator will rise. Other safety mechanisms include lid-lock mechanism and anti-clog feature. It even boasts a self-release mechanism whereby if other protections are have malfunctioned, the inner pot will disconnect from the lid by dropping down so as to release pressure. Further peace of mind is provided through a temperature sensor and with fuse protection. The cool-touch lid and handle stay cool during pressure cooking, ensuring safe and easy handling when adding ingredients to your recipes. This device doesn’t compromise on functionality. It has 14 programmable cycles including browning/sautéing, brown rice, white rice, wild rice, grains, vegetables/fish, desserts, potatoes, pork and ribs, poultry, beans, beef, and soup. The browning feature allows you to sear and brown ingredients to lock in flavor prior to pressure cooking the remaining ingredients. Additionally, it has slow-cook and automatic keep warm capabilities, keeping food warm for up to 12 hours, all with a delay timer function. The Elite Platinum Maxi 8-quart comes with a detachable power cord making home kitchen storage easy. Its detachable patented lid makes for easy cleaning of the stainless steel surface. It also includes a stirring spoon and holder; measuring cup; condensation cup; and a complete instruction manual with recipes to begin your pressure cooking adventures. It also has an indicator beep at the end of each cooking cycle letting you know when your food is ready. The large size of this electric pressure cooker is a distinct advantage, as is its functionality and programs. However, it has the fewest reviews and much lower than average ratings compared with others in our top ten and its warranty is not as long as the stove-top models. Still, being the largest of our electric pressure cookers it still warrants a place in our top ten! A top-rated pressure cooker, this unit is great for large-scale cooking (21.5 quarts!) but it takes the crown when it comes to canning. While expensive, it certainly offers spectacular features. The All American Pressure Cooker Canner is a large, stove-top design made from durable, extra heavy-duty hand-cast aluminum with an attractive, easy-clean satin finish of professional quality. It has double thickness edges for additional protection on points of heaviest wear. With a 21½ quart capacity, it holds approximately 19 standard regular mouth pint jars or 7 standard regular mouth quart jars. All American consider it to be the perfect canner for all your canning needs. This unit has the capacity needed for preparing large quantities of food and pressure cooking inexpensive meat cuts to juicy tenderness in a short time. Solely All American Pressure Canners feature a unique, precision made “Metal-to-Metal” seal. Positive action clamping locks align the cover to the base forming a steam-tight seal. Because no gasket is involved, the cover is always easily opened and sealed. For an extra measure of safety, it is equipped with two automatic venting features: the safety control valve and the overpressure plug. It also features a geared steam gauge, stay-cool top handle and pressure regulator weight with settings of 5 PSI, 10 PSI, and 15 PSI. 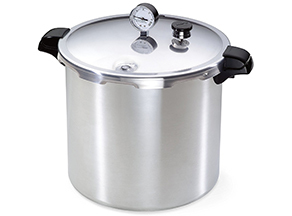 Given its large size, this top rated pressure cooker and canner is best utilized for canning although it can also be used for a number of cooking tasks. The most expensive of all our reviewed pressure cookers, coming in at over $250. This top-rated pressure cooker and canner certainly ticks a lot of boxes if you want advanced, large-scale pressure cooking. It’s not quite the biggest of our top ten, being slightly smaller than our Advanced Pick, but its intended function is more directed towards canning rather than family-meal pressure cooking. Given its high price tag, it is probably beyond a lot of people’s budget, hence its position in our top ten. When looking for a top rated pressure cooker, you want something that is long-lasting and durable. Long warranties are always an advantage but usually wear and tear is not covered. Before you make any purchase you need to be mindful of how much care and maintenance your pressure cooker will need. Some models need extra maintenance routinely, especially those with rubber seals and gaskets which need replacing periodically. On any pressure cooker, the most important thing to keep clean is the lid. Food debris must be removed from the valves and the gasket must be washed and replaced after each use. Usually, valves need cleaning with small brushes or pipe cleaners. Gaskets do wear out eventually, which will become evident when your pressure cooker takes longer to reach adequate pressure. This is entirely normal in pressure cookers with gaskets. The manufacturer will be able to provide replacement gaskets but this will be at a cost to you. You must ensure that dishwasher-safe models have all of the non-dishwasher safe components removed prior to cleaning. The composition of your pressure cooker will also mean that you should clean it appropriately: what is good for cleaning stainless steel is not always the best option if your pot is made from aluminum. If all else fails, you can’t go wrong with some hot, soapy water! As with any purchase, please ensure that you follow the manufacturer’s instructions in caring for your kitchen appliance. This will ensure longevity and full productivity of your pressure cooker for the longest possible time. Before you head out to buy a pressure cooker, it’s always best to do some research and know what you are looking for. Here, we have tried to take the pressure off your decision making with our Top Ten Rated Pressure Cookers, also providing you with budget and advanced options. So, which one will you choose? Stuffoholics’s Top Pick is a straight-forward choice for you which you can count on. We can guarantee that you will get the best performance out of this product without compromise. Rest assured that if you purchase our Top Pick, the Instant Pot DUO60 6-Qt Programmable Pressure Cooker, you will be more than satisfied with your purchase, making healthy, economical meals in minutes! It ticks all the boxes, making it our Top Rated Pressure Cooker.